On March 18th and 19thover 200 Master Chefs gathered in the Cité Internationale (in the city of Lyon, France) to celebrate the 59th Congress of the Maître Cuisinier de France association. The program consisted of a work session, lunch at the Abbaye Paul Bocuse and a gala dinner at City Hall. Gérard Collomb, Senator–Mayor of Lyon, spoke a few words of welcome to all the participants. In his speech he highlighted the importance of paying tribute to the culinary talent for its teaching, excellence and reputation. At the end of the conference, Christian Têtedoie, president of the Association of Master Chefs of France, expressed his pleasure at the presentation of 28 new members of the organization; today, there are around 300 member chefs. Most of them take their talents abroad- such is the case with Michel Mustiere, the only chef invited to this event who currently works in a Mexican hotel. 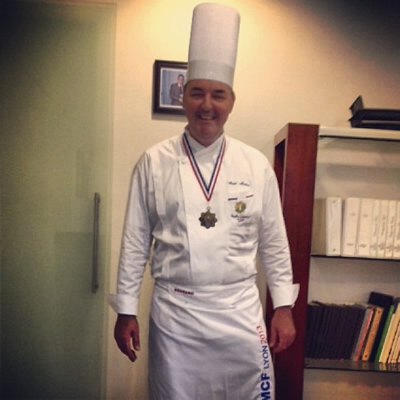 He is the executive chef of restaurant Piaf at Grand Velas Riviera Maya. Mr. Têtedoie also expressed his opinion on the essential role of women in French gastronomy, such as chefs Babette Lefebvre and Anne-Sophie Pic, both Master Chefs of France. He noted the importance of sharing culinary knowledge with young people, in order to inspire them to further the development of French cuisine.